I was doing a little reading today and often (when I am not obsessing over the trials of Bella, Edward, and Jacob) my selections are food related...shocking I know. I admit I have become quite fascinated by the Eat This Not That phenomenon sweeping the nation. I love the friendly format of the book; it is filled with bright color photos and easy justifications for banishing certain foods from civilization. I never buy half the foods in the book, but find myself riveted by the fact a chemical laden Marie Calendar's Parmesan Pot Pie shares the nutritional equivalents of eating 8 small bags of potato chips, 23 strips of bacon, and 7 Taco Bell Fresco Beef Tacos. Yuck. 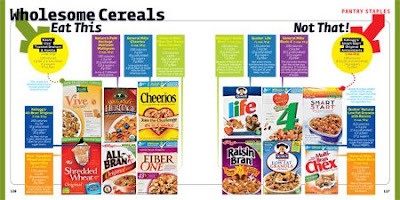 Read the cereal page and suddenly Raisin Bran is a dangerous commodity and as it turns out Life is a bad life choice. Cheerios, of course, are as perfect as we always suspected. 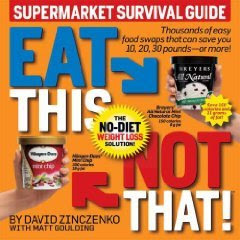 This book makes certain foods look like little ticking time bombs on their fluorescent lit shelves. Be suspicious. For me, however, the most shocking information contained in this little good versus evil bible of food can be found in a table on page 6..."The Wrong Kind of Protein: The little "bonus" ingredients the FDA allows in your food." According to FDA regulations canned pineapple can legally contain up to 20% moldy fruit, canned tomatoes can contain up to 5 fly eggs or two maggots per 500 grams, potato chips can contain up to 6% rotten potatoes, ground cinnamon can contain 400 insect fragments and 11 rodent hairs per 50 grams...and on and on. It strikes me as odd that I can get a citation for leaving sticks in my alley or having water in the saucers of my flowerpots, but if I find mites in my frozen broccoli I should turn a blind eye. There is so much hysterical information in this little book I am not sure what to do with it all, but I think it may be time to take up farming...because going to the grocery store is scary. I don't know about you, but I am not a fan of allowing any number of rat pellets in my popcorn. Not sure that would be the life for me, but it's interesting. as for the sticks, while living in OP,I got a citation for not having my address on my garage in the mean time I had gun tottin crack dealers across the street. Where is the ying and yang in that?